In the team race, the boys put together a solid meet, scoring 87 points and placing 3rd. They were only .5 points from second and 8 points from 1st place. In fact, only 25.5 points separated the top six teams in the meet, a sign of parity that hasn’t been seen in perhaps the entire the history of the EDC. The continuing quest for the outdoor East Region title appears to be a dogfight, with a number of teams in the hunt. The top point scorer for the Riders Friday was freshman Amit Rasaily, who turned even more heads than he did last week in his season debut at NDSU. Placed in the third heat by virtue of his 2018 time, Rasaily stormed to dominating victory in his 300m Hurdle heat, clocking an impressive 43.16. The time was good enough for second place overall. In similar fashion, junior Keandre Anderson easily won the second heat (43.81) and found himself in 4th place overall. The two hurdlers, unknown to most EDC competitors, will no longer stay unnoticed after strong performances Friday. Rasaily also placed 6th in the 60m Hurdles (9.67) and ran a leg on the second-place 4×400 relay team to finish with 13 points. Other top point scorers included senior distance standout Jake Arason (12 pts), Kaden Rohloff (10 pts), and Brett Klefstad (8 pts). Rohloff had a monster day in the pole vault, clearing a lifetime PR of 13’6 to win the event. He just missed 13’9, which would have tied the junior class record. His best jump heading into the season was 12’6. His jump puts him in a tie for #5 All-Time in the pole vault at RR. Additionally, Sophomore Erik Walker cleared 9’6 to place 8th in the vault. Klefstad threw 47’3.5 to place second in the shot put, continuing his strong start to the season. Also hitting a big mark was junior Cole Ogren, who placed 8th with a PR toss of 42’0. In addition to the fantastic 4×800 relay, the 4×400 and 4×200 relays also performed well Friday. In a thrilling end to the meet, Sartwell teamed with Anderson, Arason, and Rasaily for a second place finish and new season best time of 3:37.26. Sartwell lead off in 55.9 before handing off to Anderson, who unleashed a 4×4 fury only seen in comic books and folk tales. Despite getting the baton behind all other teams, Anderson found another gear and cruised a 53.9 split, passing all other teams and handing the baton off in first. Arason, who had never broken 60.0 in a 4×4 split before this season, continued his PR onslaught and managed a 54.7 split before handing off the baton in second place to newly appointed freshman phenom Rasaily. Although not catching Shanley’s strong anchor runner, Rasaily wowed the crowd with a head-scratching 52.9 split. To say that’s a strong time for a freshman is an understatement. In the 4×200, the quartet of Austin Oehlke (24.0), Brady Dvorak (24.3), Ethan Brandvold (24.3), and Maxx Andrade (23.6) placed fifth with a season-best time of 1:36.22. All splits were season bests, with the time from Andrade the second fastest of any Rider this season. The EDC Indoor meet started off with a bang when the Red River 4x800m relay team of seniors Jake Arason (splitting 2:02.60), Stoker Short (2:07.30), Zach Simon (2:05.70), and Marcelles Sartwell (2:05.33) placed second with a whopping time of 8:20.93. The state-qualifying time set the indoor school record and is the fastest 4x800m relay run since 2013. The four hope to reunite outdoors, when the relay can officially state qualify. The Riders also had an excellent day in the open 800m run, with all four of the runners setting new personal bests. Joining the sub-2:10 club were the previously mentioned Zach Simon (6th- 2:08.99) and sophomore Mustafe Abdi (7th- 2:09.83). Abdi’s time was a massive PR of 10.66 seconds from only a week ago. Also throwing down a large PR was freshman Dameon Zenawick. His 2:13.61 is a new best by 7.39 seconds. The other two distance events were raced at the collegiate distances this weekend. The typical 1600m and 3200m runs were exchanged with the 1500m and 3000m runs on the UND High Performance Center’s 300 meter track. After splitting a personal best 2:02.6 in the 4x800m, Arason ran 4:18 to finish a close second in the 1500m. This mark was technically a 12 second PR, since he had not run the 1500m since last year at this meet. Also placing in the event was freshman standout Hunter McHenry. After running the 3200m the last two meets, McHenry opted for an event less than half as long, finishing 8th with a time of 4:35. However, he decided that the 1500m wasn’t enough and additionally switched into the 3000m at the last minute. McHenry (3rd- 9:44) was one of three Red River placers including sophomore Broden Diederich (5th- 9:55) and 8th grader Matt Rongitsch (6th- 9:58). Due to the odd distance not usually run at the high school level, Diederich notched a 52 second PR dating back to last season. The JV meet started the following morning with a 4x800m relay team comprised entirely of 8th graders. The team of Grant Lelm (2:18.90), Matt Rongitsch (2:20.60), Jonah Dafoe (2:26.20), and Jake Jenkins (2:28.20) placed 3rd, with each of the four setting a new personal best. Three of them went on to set new PRs in the open 800m later that day. “By the end of the year, we want our middle school 4x800m team under nine minutes,” Coach Dafoe said following the race. The four showed plenty of promise and enough potential to accomplish that goal. After placing 5th in the 3000m on Friday, Diederich came back on Saturday to comfortably win the 1500m with a time of 4:40. Despite having to pace himself by running the entire race alone, his time would have placed him 11th overall at the varsity meet. As mentioned earlier, the 8th grade quartet of Lelm, Rongitsch, Dafoe, and Jenkins all performed exceptionally well in the open 800. Lelm won the race with a time of 2:16.86, followed by Rongitsch in 4th, Dafoe in 5th, and Jenkins setting an enormous 14 second open PR in 10th. Also worthy of special notice are senior Nate Tabor and sophomore Dylan Sollund. After switching between distance and sprinting in the last year, Tabor joined the newly-created mid-distance group. He had yet to run under 60 seconds for the 400 until this Saturday, when he not only went sub-60, but unleashed a 57.51 second 400 to set a new personal best by 2.77 seconds and place 4th. 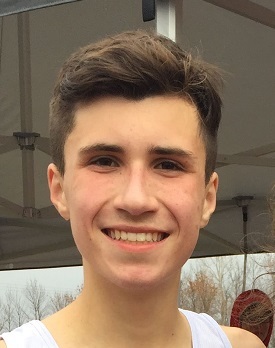 First year athlete Dylan Sollund, who has only been with the team for a few weeks, improved 8 seconds from his 4x800m split to his open 800m run on Saturday. This is a major accomplishment for Sollund, who ran under 3 minutes (2:59.24) for the first time. -Dorsey is a junior distance runner for the Riders and an aspiring sports journalist. 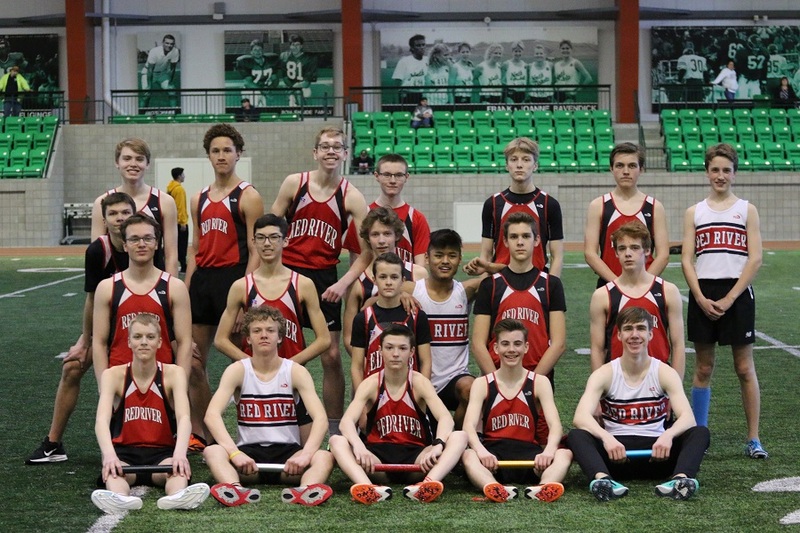 On Saturday, the future stars of the East toed the line at the EDC JV Indoor meet. With quality depth in all event areas, the Red River Boys took home the team title, scoring 187.5 points. Event winners included Broden Diederich in the 1500m, Grant Lelm in the 800m, Dilson Gurung in the triple jump, and the 4x200m relay team of Gurung, Ted Tchomakhidze, Monoj Rai, and Rasaily. Gurung had the biggest day of any athlete, scoring 22.5 points alone. He also placed second in the 200m (24.76) and ran a leg on the second place 4×400 relay team. Other big point scorers at the meet included the freshman Rai (16.5 pts), 8th grader Lelm (13.5 pts), 8th grader Lukas Heydt (13 pts), Rasaily (10.5 pts), sophomore Diederich (10.5 pts), 8th grader Carter Byron (10 pts), and 8th grader Jonah Dafoe (8.5 pts). Perhaps the most exciting moment in the meet came as teams started to prepare for the 4×400 relay. With five RR teams entered, 20 athletes were needed to fill all spots. After a couple of injuries took some athletes out of the running, it was decided that we would drop a team and consolidate those still able to run. Athletes came out of the woodwork to join teams. In the end, no consolidation was needed and five relay teams ran. Athletes who had never ran a 400 did what they could for their team and their school and gave it their all. A fun moment to witness. Most exciting was the race finish, in which the relay team of three 8th graders and one freshman fill-in (Lelm, Gurung, Byron, Heydt) battled to the wire with West Fargo. Amazing to witness what the human body can do in the heat of competition.